Last October, the CEO of Psyonix released a public statement via Reddit about the current state of cross-platform play in Rocket League. At the time, it was mentioned how it would take a while to unify the community. With special thanks to all of our friends and colleagues at PlayStation, we are thrilled to announce that starting RIGHT NOW, Rocket League has entered the PlayStation Cross-Play Beta program! Players on PlayStation 4, Nintendo Switch, Xbox One, and Steam can now randomly matchmake with or against each other in all Online match types (i.e. Casual, Competitive, and Extra Modes). Today's announcement is an important one for us here at Psyonix, because we know how much our community has wanted FULL cross-platform support for quite some time. It's because of YOU, our fans, and our generous partners on all systems and services that have made this possible in the first place. On behalf of the entire team, THANK YOU for your passion and persistence as we continue to do our best to make Rocket League the best experience we can. In order to play with PlayStation players and users on other platforms, you'll need the cross-platform play option enabled (it is by default) in the options menu. This isn't the only news Psyonix had to share. The first update this year will allow players to create and join cross-platform parties. More information about this will be revealed soon. 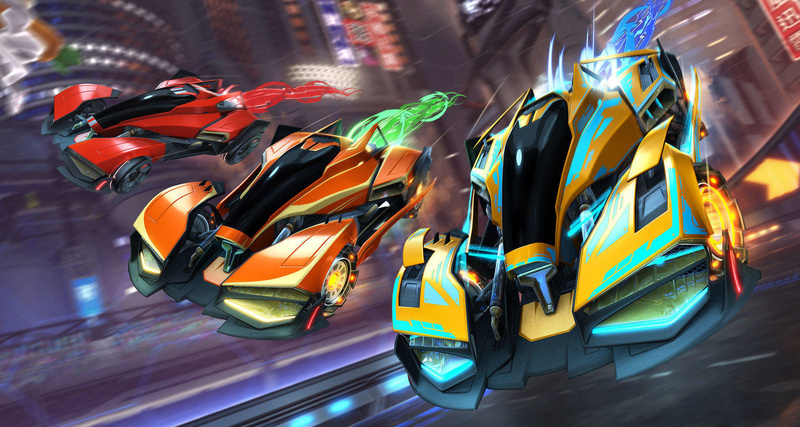 Will you be joining in on the cross-platform play fun in Rocket League? Tell us below. It's about time Sony got on board. This is huge. And absolutely fabulous for us gamers! Wow. Took them almost 4 whole years. Nice job! @TF-Warrior Why is it not good? This will hopefully make it a bit easier for me to find a match. Rocket League doesn't seem to have taken off in South East/East Asia, at least on Switch. I'm lucky if I can find a 1v1 match. So now what do I do with the other two copies I have??? @Tasuki play a 3 way game yourself. This is great news. I can’t wait to see crossplay on more games in the future. It is only good for the community. Just think, even Destiny 1 would have a thriving community if they allowed crossplay last generation between the four systems (PS3/PS4/Xbox1/360). It’s not gonna happen on older games, but easily doable for Destiny 2, Overwatch, Warframe and other games like that. Another game for Cross Play, it's about time for Rocket League. Hopefully those on each system can use purchased content from one system on another, and transfer progress. @Jimez that would be cross progression. Not sure if they are allowed to do that. As a fan of Rocket League, this is good news. It is a great game to jump in for a few matches at the end of the day. I have been playing it for more than a year and it has not grown old. Now with more players, it should be even better. This is the future of gaming, being able to log on onto any device and keep playing the same setup and not isolating, dorky headsets. ...but this is certainly a huge win and a great start - and when the Rocket ID update (allowing 'full' cross-network play) eventually rolls out, bringing with it unrestricted cross-play across all supported platforms - it'll be absolutely fantastic! Having PC, Xbox, PlayStation and Switch players all connected with each other (albeit, so far, still only in 'Beta' mode in a couple of games) is one of my favourite things about modern gaming - this is the kind of gaming future I always wanted to live in! Welcome aboard, Sony - thanks for (belatedly) joining the party! Now I can play random matches on PC with my Switch friends. But why did I have to wait for Sony to get on board? Was that the only reason for the numerous delays?